Bangkok – A Disaster Waiting To Happen? Bangkok is the capital of Thailand and one of the largest cities in the world by population – it is considered to be a primate city and is of huge importance for the economy, politics and governance of the country. The greater metropolitan area of Bangkok has a population of over 14 million and a large portion of Thailand’s population lives here. Due to Bangkok’s location, and the Chao Phraya River pulsing through the city centre, it has seen several natural disasters during its history. Many people living here, and real estate investors, are scared of such occurrences happening again. Although there is no guarantee that a natural disaster will not happen again, the Thai government has greatly increased the city’s defence network to help prevent any disasters from causing lasting damage to its infrastructure and population. Why Does Bangkok Need Disaster Defences? As mentioned above, Thailand itself has seen a fair share of natural disasters such as landslides, flooding, tropical storms and tsunamis. Notable disasters in Bangkok include the devastating floods in 2010 and 2011 that affected over 7 million people and caused widespread damage in the capital and surrounding regions. Due to the adverse weather that can occur in Thailand, and the unstable nature of the Chao Phraya River, Bangkok is a prime location for flooding. Furthermore, the capital of Thailand has been built on historical flood plains and land that was traditionally used for agriculture and the growth of rice etc. This land would have flooded regularly and in fact, the rice paddies would have been intentionally flooded to improve growing conditions. Due to these factors, the land surrounding the Chao Phraya River is still susceptible to floods and contains ground that is not as solid as other inland areas. The latest development in the capitals defence network is the series of underground tunnels that will improve water drainage and help to alleviate flood pressure. Most prominent of these tunnels is the section running from the Lat Phrao canal into the Chao Phraya River – at a staggering 6.4km in length, the tunnel will provide relief for several flood prone areas within Bangkok. Furthermore, a pumping station will be built to help maintain a fast flow of water during times of flooding. 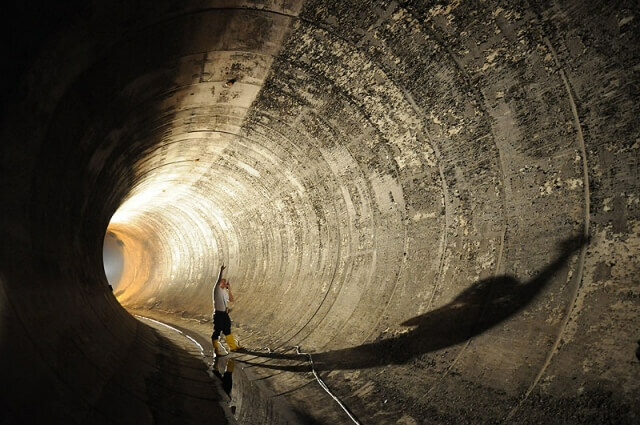 At a costly 2.4 billion Baht, the Chao Phraya river drainage tunnel is an immense 5 meters In diameter and is reported to be able to carry water at a sustained rate of 60 cubic meters per second. Aside from providing flooding relief, the tunnel will also help improve Bangkok’s outdated drainage system that is due for a further overhaul. Areas that will benefit from this impressive construct include Phahon Yothin Road, Lat Phrao Road, Vibhavadi Rangsit Road, the bang Sue Canal and a great deal of the intersecting land around these districts. This tunnel is one of a series of constructs throughout Bangkok that aim to greatly improve the city’s defence against flooding and heavy rainfall during the monsoon season. Aside from the network of drainage tunnels, the city also has employed an extensive flood defence network. After the flood disaster in 2010 and 2011, it was clear that something had to change and that the city did not have sufficient defences to cope with such a large volume of water in a short period of time. Since then, the government has created several defence systems aimed at providing fast and effective relief to affected areas. The flood protection system is complex and contains a plethora of different elements. Examples of defences in place include flood barriers surrounding industrial and residential areas, specially created dykes and dams to reduce water flow and re-direct its current, and even flood gates and diversion weirs. Furthermore, drainage system and water plains are regularly dredged to create additional space for water to flow and to widen the water current. All of these creations work together to improve the flow of water and to reduce the chance of floods causing damage to Bangkok’s infrastructure. This is music to the ears of Bangkok real estate investors. To manage this network of defences and to provide assistance during times of natural disaster, the Flood Relief Operations Centre (Froc) is the primary organisation. This organisation is dedicated to assisting during times of trouble and managing Bangkok’s flood defences. This allows over governmental organisations to concentrate on their own roles and creates an effective system that benefits the people of Bangkok. As you can see, Bangkok has come on leaps and bounds in the last 5-10 years and has taken great steps to improve its disaster defence network – in particular against its greatest risk – flooding. Although previous natural disasters have caught the city by surprise, the government has learned from its mistakes and is now taking a pro-active and preventative approach. This is to ensure that Bangkok’s population and increased infrastructure remains as safe as possible. In the past, the lack of adequate flood defences and disaster prevention measures has put doubt in the minds of real estate investors in Bangkok. Why should someone invest their time and money in an area that has seen several large scale natural disasters that have wreaked havoc on the population? This is no longer the case. Investors have renewed confidence in the Thai government and the strength and reliability of Bangkok’s disaster defence network. If a natural disaster such as a flood does occur again in the future, the population can be assured that their livelihoods, properties and worldly possessions will remain safe.